This is the company blog for Augmenter la Connaissance Compagnie, Inc. I promise to share any know-how I come across, which might prove useful to small, independent merchants. All company and promotional news releases will be posted on this blog. on December 1, the award-winning documentary "How Do I Look" will be screened at two different film festivals in New York City. 5th Annual New York AIDS Film Festival at NYU at 11 am on December 1. A screening of the entire documentary of "How Do I Look" will take place at the 15th Annual African Diaspora Film Festival at Riverside Theatre in Harlem at 8 pm on December 1. Each screening will be followed by Q&A with director Wolfgang Busch. "I am privileged and honored that 'How Do I Look' has been selected this year by two different film festivals as part of their World AIDS Day programming," said Busch. "One of the primary intentions of this documentary was to empower the Ball community to overcome their adversities. And the positive messages of AIDS prevention and awareness that I put into 'How Do I Look' are giving the Ball community something they need, which is hope and education, in dealing with the AIDS pandemic. Until there is a cure for everybody, what we need is an emphasis on education for prevention and care, as well as hope." "How Do I Look" is about the Harlem "Ball" community that originated in the 1970s in Harlem, an off-shoot of the Legendary Harlem "Drag Balls" from the 1920s. This African American and Hispanic Lesbian, Gay, Bisexual and Transgender community is best known for its worldwide influences in dance, fashion, runway, and music -- inspiring Madonna with her best selling music video "Vogue," Boy George, fashion designer Thierry Mugler and Marc Jacobs, the music of RuPaul and #1 Billboard dance performer extraordinaire Kevin Aviance with producer GOMI. This trendsetting artistic community is unfortunately also hit hardest by the AIDS epidemic. 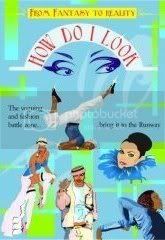 Since the beginning of the production of the "How Do I Look" documentary in 1995, ten members from the "Ball" community have passed away: Willi Nijna, Fila Omni, Angie Infiniti, Eric Christian Bazaar, Marcel Christian, Gerald Dupree LaBeija, Mystery Royale, Kenny Ebony, Pepper LaBeija, and Billy Pemperton – eight of whom have died from AIDS. To date, many members are struggling every day with the HIV virus. For that reason, much of this community's history and legacy is lost forever. This ground-breaking, inspiring, educational and entertaining documentary, now available on DVD, talks about the history of the dance "Vogue" by Willi Ninja, Jose Xtravaganza, and Andre Mizrahi; it sends HIV hope messages by Luna Khan; "Bazaar" fashion designs by Ross Infiniti; runway by Ricky Revlon; transgender issues by Tracy Africa, Carmen Xtravaganza, and Octavia St. Laurent; and the "Ball" history by Marcel Christian and Kevin Omni. "How Do I Look" also features a poem by Emanuel Xavier and special appearances by columnist Michael Musto, stylist and fashion designer Patricia Field, and Kevin Aviance. The 5th Annual New York AIDS Film Festival. On World AIDS Day (Dec. 1), "How Do I Look" will be screened at 11 am at New York University at the King Juan Carlos I of Spain Center, 53 Washington Square South. Admission to attend this special screening is free. Complimentary refreshments will be served. SUBWAY INFORMATION: Take the A, B, C, D, E, F and V trains to West 4th Street. The 15th Annual African Diaspora Film Festival. On World AIDS Day (Dec. 1), "How Do I Look" will be screened at 8 pm at the Riverside Theatre, 91 Claremont Ave. @ 120th Street, (212) 870-6784. Tickets cost $10. SUBWAY INFORMATION: Take the 1 train to 116th Street. More information about "How Do I Look:"
"How Do I Look" is released and distributed independently by Art From The Heart LLC, and we are proud to represent LGBT content at the up-coming prestigious African Diaspora Film Festival in Harlem. Founded in 2003 by Suzanne Engo, the New York AIDS Film Festival provides a series of HIV- and AIDS-related film screenings, panel discussions, and special events. At the time of its launch, Ms. Engo said, "I know that the media can be used as a tool for social change." Its mission is to provide the public with information about the disease by sponsoring the screenings of visual media. The Festival features diverse works, which serve as educational material about HIV/AIDS. These programs aim to promote social action in the fight against the global AIDS pandemic. Besides featuring noteworthy visual media by filmmakers and AIDS activists, the Festival also creates events to raise money for organizations whose missions include education and social activism through film. ADFF's mission is to present films to diverse audiences, redesign the Black cinema experience, and strengthen the role of African and African descent directors in contemporary world cinema. In response to this mission, ADFF features the work of emerging and established filmmakers of color. Most important, ADFF distinguishes itself through its presentation of outstanding works that shine a different or comprehensive light on African Diaspora life and culture --no matter what the filmmaker's race or nationality. About future screenings and where you can buy "How Do I Look:"
"How Do I Look" is currently screened in film festivals across the United States and internationally, and the "How Do I Look" DVD is available on our website, www.HowDoILooknyc.org, on Amazon.com, and through selected retail stores: at Kim's Video in New York City, at Giovanni's in Philadelphia, and at A Different Light book store in Los Angeles. Order your copy of How Do I Look from Amazon. Subscribe today to Time Out New York. Receive free issues or special discounts with your paid subscription. About Augmenter la Connaissance Compagnie, Inc.
Augmenter la Connaissance Compagnie, Inc. is an internet marketing services company based in New York City. It's mission is to promote worthy products and services directly to buyers. For more information about Augmenter la Connaissance Compagnie, Inc., please visit its website for a description of its internet marketing services.